Kaga Bandoro – This week IOM, the UN Migration Agency, completed the relocation of 698 internally displaced households from the impromptu camp that formed around MINUSCA’s (Multidimensional Integrated Stabilization Mission in the Central African Republic) base following the 2016 attacks in Kaga Bandoro, Central African Republic (CAR). Over 20,000 people settled around the base after ex-Séléka members attacked the Evêché IDP camp, the Prefect’s office and the MINUSCA camp on 12 October 2016. One of the blocs constituting the provisional camp borders an airstrip (Bloc One) and another (Bloc Nine) was near the fuel depot, exposing residents to health risks. Bloc One has also complicated the landing and take-off of planes, forcing humanitarian aviation operators to suspend flights. This gravely affected surrounding communities and humanitarian efforts by preventing the adequate implementation of programmes and the evacuation of serious medical cases. 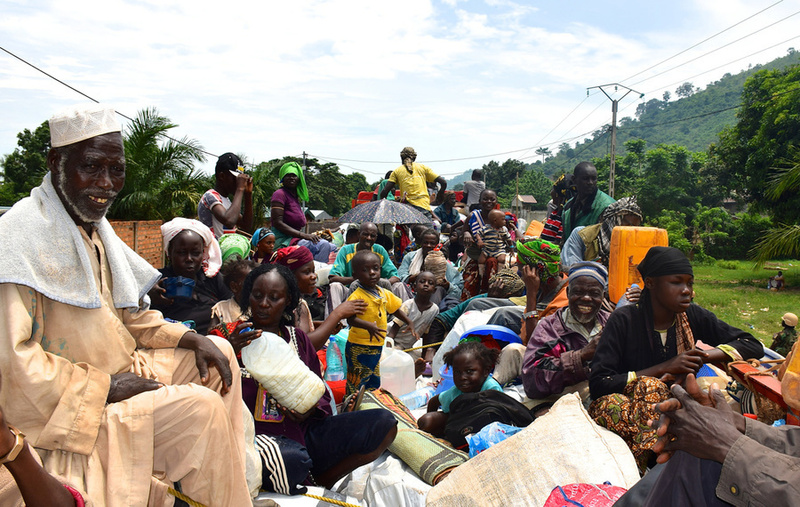 “The dangerous position of Blocs One and Nine made it very clear to IOM and CAR’s humanitarian team that everyone must be urgently relocated to a safer location,” said IOM CAR Chief of Mission Dr. Jean-François Aguilera. Following the visit of the Humanitarian Coordinator and the Ministry of Humanitarian Actions of Kaga Bandoro in August, it was recommended that all the IDPs be urgently relocated to new and safe nearby locations. After numerous consultation sessions with residents of the camp, and in partnership with OCHA (United Nations Office for the Coordination of Humanitarian Affairs) and the UN Refugee Agency (UNHCR), the relocation of the first bloc started on Tuesday 17 October and finished on Wednesday 25 October. It involved 312 households, of which 15 returned to their old neighbourhood. The relocation of Bloc Nine began on Thursday, 26 October and finished on Friday, 3 November. This one included a total of 319 households, with one returning to its old neighbourhood. A last group of 67 households close to Bloc One were also relocated from Saturday, 4 November to Tuesday, 7 November. “The consultation sessions with the households allowed us to ensure that their particular needs are met and they are fully informed and consulted all along the process,” said Dr. Aguilera. IOM assisted the 682 relocated households in transporting all their belongings, including huts and hangars, to new and safe locations. They also received a total of USD 30,103 (USD 44 per household), as well as non-food item kits. The 16 returning households were provided with return kits and assisted in the rehabilitation of their homes and the transportation of their belongings. CAR is experiencing a resurgence of violence and faces the risk of a repeat of the devastating crisis that beset the country four years ago. The number of both internally displaced persons and refugees in neighbouring countries have dramatically increased over the past few months.